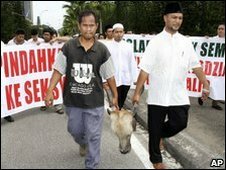 Six Malaysian Muslims have been charged with sedition for parading the severed head of a cow through the streets of Shah Alam in Selangor state last month. The men were protesting against the building of a Hindu temple near their neighbourhood. Some of the demonstrators stamped and spat on the cow's head. The six accused men were among a large group of people who marched from a mosque in Shah Alam, the capital of Selangor state, to the state chief minister's office on 28 August. Their actions were recorded on video and uploaded onto the internet. Defence lawyer Salehuddin Saidin said his clients were carrying the cow head to illustrate the state government's stupidity - and did not intend to offend local Hindus. "For Malays, the cow symbolises stupidity, not an insult to any other religion," Mr Salehuddin told the Associated Press. But P Uthayakumar, a prominent Hindu activist, dismissed this argument as a "lame excuse", saying the protesters were "clearly inciting the Hindus". Indians - most of them Hindu - make up 9% of Malaysia's 27 million people. Analysts say the protest reflects the increasingly difficult task facing Prime Minister Najib Razak, as he tries to calm ethnic and religious tensions.